Wolli Creek is very special for a waterway so close to the centre of the City and the Airport. 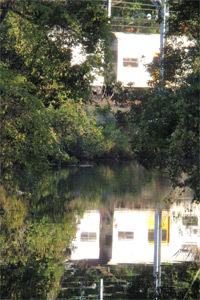 Unlike the Cooks River for instance, Wolli Creek retains most of its natural banks and hasn’t been concreted in with artificial sides. Large sections of it are clogged with weeds though and it needs careful planning to bring it back to some of its natural beauty. The creek banks, or riparian zone, also play an important part as a wildlife corridor. 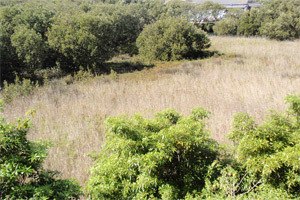 However, the creek itself, its southern bank and the Waterworth Park section of the northern bank were specifically excluded from the Wolli Creek Regional Park. Work has started on reducing rubbish, silt and nutrients coming into the creek. In the last two years, major funding of $1Million from the Commonwealth Government’s Cooks River Urban Water Initiative has enabled the management and treatment of stormwater in many of the side streams crossing the bushland to Wolli Creek. This is complemented by work under the Cooks River Sustainability Initiative, funded by the NSW Environmental Trust. As part of an overall $2M grant, this is engaging the community in the upper Wolli Creek catchment in Water-Sensitive Urban Design thinking and projects. You may notice that Gross Pollutant Traps have been installed on smaller creeks to stop rubbish such as PET plastic bottles reaching the creek. The largest of these is on Turrella Creek in Turrella Reserve. In 2010 Turrella Creek is also being re-landscaped and revegetated. Efforts to develop a plan of management for the riparian zone from Bexley North to Tempe unravelled two years ago when a consortium of WCPS, CMA, two Councils, NPWS and RailCorp failed to gain external funding for the task. A new round of efforts has revealed renewed interest among the partners with possibly enough internal funding for the preparation of an agreed plan. All the partners should then be in a position to seek various funds to begin work on the main vegetation problems of the zone – vines and willows. This stretch of the Creek presents significant opportunities for riparian zone management, with largely natural creek banks and opportunities for vegetation management. Four management issues relating to the riparian zone to be addressed are vegetation, fauna, creek banks and litter and illegal dumping. If you are interested to keep in touch with developments, contact WCPS* and we’ll include you in the conversation.